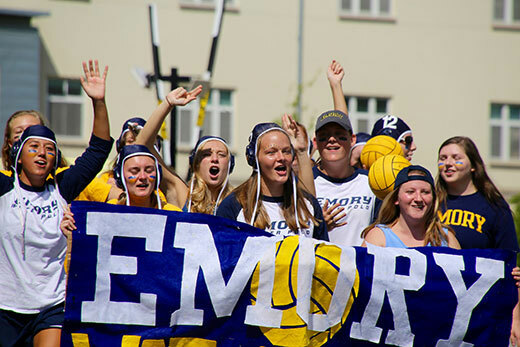 Emory's water polo team marches in the 2016 Homecoming Parade. This year's parade steps off Saturday, Oct. 21, at 12:30 p.m. from Asbury Circle. Photo by Jake Rosmarin. Get more information on student Homecoming activities, Family Weekend and alumni Homecoming events. Emory Homecoming is the week of Oct. 16, packed with activities, events and traditions for students and alumni. Homecoming Weekend, Oct. 20-21, also coincides with Family Weekend, with several overlapping events. This year’s Homecoming student theme is "Emory Land" — a play on "Candy Land" — and most activities center around popular board games, according to Arthur Menezes, one of the chairs of Homecoming. “Unlike previous years where Homecoming was centered around Swoop, this year is a holistic celebration of all things Emory, including Swoop and Dooley,” Menezes says. Emory Land Homecoming 2017 kicks off on Monday in Asbury Circle from 12 p.m. to 2 p.m. where the Candy Land board game will come to life. Students can participate in a candy walk; eat cotton candy, frozen custards and cake pops; and play games. On Tuesday, Asbury Circle will be transformed into a real-life Monopoly board game called "Swoopopoly." From 1 p.m. to 4 p.m., students can travel around the board game completing different tasks and earning stamps to get prizes. Students will also get the opportunity to dunk members of the Student Programming Council and take pictures in a photo booth. "The Game of Emory" is the theme for Wonderful Wednesday, held from 12 p.m. to 2 p.m. in Asbury Circle. Students can play various carnival games for a chance to win prizes while eating funnel cakes, popcorn and snow cones. Later, comedian Alingon Mitra will perform at Harland Cinema. Doors open at 7 p.m. The College Council will host "Scoops and Ladders" on Thursday in Asbury Circle from 12 p.m. to 2 p.m. Students can eat buttercream ice cream and play on an inflatable slide. That night, the University Center Board will host a trivia night themed to the board game Trivial Pursuit at the Campus Life Pavilion on Peavine Creek Drive from 7 p.m. to 9 p.m. The annual Homecoming Ball will be on Friday featuring a performance by Post Malone beginning at 8 p.m. Prior to the concert, students can enjoy First-Year Dinner on the Wagner Quad from 6 p.m. to 8 p.m.; the Greek Block Party on the Sorority Lawn from 4 p.m. to 6 p.m.; and Eat to Beat Cystic Fibrosis hosted by Delta Phi Epsilon in Asbury Circle. Homecoming events culminate on Saturday with the Homecoming Parade, which starts at 12:30 p.m. and makes its way down Asbury. Alumni, parents and students are welcome to come enjoy the parade and then the Alumni Homecoming Concert featuring a performance by the Plain White T's. Doors to the concert open at 1:30 p.m. Alumni events for Homecoming kick off on Thursday, Oct. 19, at 10:30 a.m. with the Golden Alumni Brunch for those who graduated at least 50 years ago. Throughout the weekend, each of Emory’s schools and units will host specific events for alumni. A historical walking tour of campus steps off at 4:30 p.m. with Gary Hauk, university historian and senior adviser to the president, starting at the rock structure near Alabama Hall. The tour is also part of the Family Weekend. Cocktails and Community Engagement: Building Atlanta Together, a conversation led by Emory Atlanta Young Alumni on the importance of civic participation, will be held at the Miller-Ward Alumni House from 6:30 p.m. to 8:30 p.m.
WISHDUST, a Staibdance Dance Performance, includes Emory alumni and takes place at 7:30 p.m. in the Dance Studio of the Schwartz Center for Performing Arts. Dancers and Emory’s Vega String Quartet premiere this new work. The cost is $15 for parents of current Emory students; $8 all students; $20 all others. A free concert by the Emory Wind Ensemble features the world premiere of Emory alumnus Nikoloz Kevkhishvili 13C’s newest film, “In Her Image,” with an original score by Emory Symphony Orchestra conductor Richard Prior, conducted by Emory Wind Ensemble conductor Paul Bhasin. The performance begins at 8 p.m. in Emerson Concert Hall of the Schwartz Center for Performing Arts. Also, on Friday, Family Weekend events feature sessions on the career center, study abroad opportunities and information about the math and science program, as well as Goizueta Business School. The Homecoming/Family Weekend 5K Run/Walk through Lullwater Preserve starts at 9 a.m. at the Student Activity & Academic Center on Clairmont Campus and goes through Lullwater Preserve. Online registration is encouraged, but walk-ups are welcome. Prizes will be awarded to male and female winners in age groups of 21 and under, 22-29, 30-39, 40-49, and 50 and up. The Welcome Center at the Peavine Parking Deck opens at 10 a.m. and continues until 5 p.m. with Emory t-shirts and schedule updates. The Emory Alumni Authors Showcase will be held at Asbury Circle/Dooley's Statue from 11:30 a.m. to 1:30 p.m.
“Emory Street Eats” Food Truck Park will be in Asbury Circle from 11:30 a.m. to 2:30 p.m. Buy a Homecoming lunch in the heart of campus. Complimentary Coca-Cola beverages will be available. The annual Homecoming Parade begins at 12:30 p.m. at Asbury Circle, processing through campus, after which McDonough Field will open up for the 1:30 p.m. concert with the Plain White T’s. For children, there will be a Costume and Reading with Curious George at 12 p.m., 1 p.m. and 2:30 p.m. The free event will be at Emory Bookstore in the children’s section on the first floor. A Cookie Social will also be held at the Emory Bookstore on the second floor at 1:30 p.m. The Emory Concert Choir performs a free concert at 8 p.m. in Emerson Concert Hall in the Schwartz Center for Performing Arts, celebrating music professor Eric Nelson's 20th anniversary as Emory's choral director. The current Concert Choir will sing the first half of the program, and then more than 60 alumni of Concert Choir from all over the country will join them on stage to sing the second half. Saturday will also have a variety of academic sessions with opportunities to interact with faculty; athletic contests for volleyball, swimming and diving and soccer; and informational events such as admissions information with campus tours.